Fall is a good time for a home checkup. Start by taking a car key or house key and poke around the bottom of garage door surrounds, entrance doors and window trim. Soft or discolored wood could be signs of water damage or even termite damage. 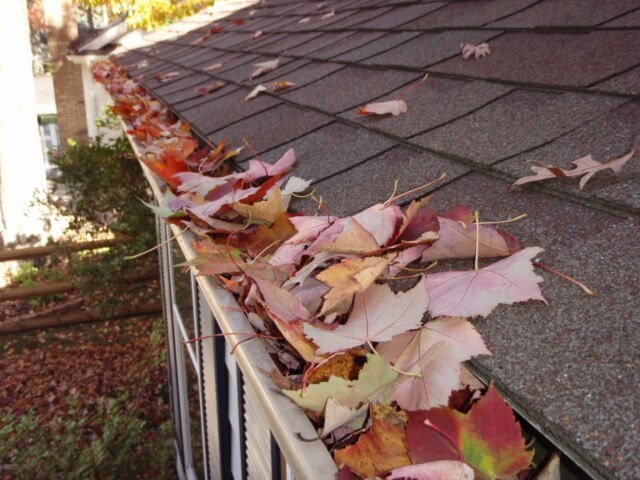 If gutter s are overflowing with leaves and debris, take time to clean them or hire a licensed and insured contractor to do the work for you. Clogged gutters can cause rainwater to run underneath shingles and behind soffit and facia boards. If water gets into those areas, the wood could rot and cause nasty roof leaks. If there are plantings around the perimeter of your home, make sure the plantings are trimmed to leave about 18 inches of distance from the home’s foundation. This will allow air to circulate and prevent mold and mildew from accumulating on the home’s exterior. When plants are trimmed back, they are less likely to infiltrate the home’s exterior treatment. Keeping plants away from a home’s exterior will also help keep bugs and other critters away. Look at the trim and siding. If caulking has pulled apart or even fallen out, re-caulk those areas to prevent bugs and air infiltration. Keeping your home sealed and caulked tightly will save money on heating and cooling bills. If the siding is chalky, cracked or peeling, it is probably time for a paint job. Unfortunately, Georgia’s climate is hard on a home’s exterior. If it has been more than five years since your home was painted, it is probably time to do it again. Be sure to choose a painting contractor carefully and make sure the contractor is fully insured. Remember that cheaper does not mean better, especially when you are painting. The time spent cleaning the exterior, removing loose paint, replacing damaged and/or rotten wood, caulking and priming are just as important as the paint itself. Caulking a few joints and blowing paint on your house is not a proper paint job. Keep your home in tip-top shape and it will keep you safe and dry for years to come. Jeff is a licensed and insured general contractor. He is a lifelong resident of Cobb County and has lived in the Acworth community for the past 17 years.